Asbestos or possible asbestos containing material that is to be removed during remodeling, repair or demolition shall be sampled by a MoDOT Asbestos Inspector. Material that tests positive for asbestos must be removed by a permitted removal contractor and overseen by a MoDOT Asbestos Contractor Supervisor. All asbestos containing materials shall be handled according to local, state and federal regulations. Asbestos containing materials that do not have to be removed or disturbed shall be left in place. Materials found to have been damaged or become friable (crumbles easily) will be repaired or removed and replaced with non-asbestos containing material. All asbestos work must be done by qualified personnel. There are two types of notifications required by MDNR in regard to asbestos abatement and demolition. Asbestos abatement notification must be provided to MDNR at least 10 working days prior to the start of the project. Demolition or major renovation notification must be provided to MDNR at least 10 working days prior to the start of that project. The demolition notice is required even if there is no asbestos identified in the project. 1. Bridge maintenance work renovations that impacts ACM over the regulated threshold quantities of 260 linear ft., 160 ft2, or 35 cu. ft.
MoDOT is required to notify MDNR at least ten (10) working days prior to beginning of project and submit an Asbestos Project Notification (MDNR Form MO 780-1226) and an Asbestos NESHAP Notification of Demolition and Renovation notification (MDNR form MO 780-1923). MoDOT will submit an Asbestos Post-Notification (MDNR form MO 780-1225) when project is completed. All ACM material removed will be packaged, mark and disposed as Regulated Asbestos Containing Material (RACM) in a landfill that accepts RACM. MoDOT employees who work on ACM on bridges will be certified Asbestos Supervisors or Workers by MDNR. 2. Bridge maintenance work renovations that impacts ACM under the regulated threshold quantities of 160 ft2, 260 linear ft., or 35 cu. ft.
.	MoDOT is not required to notify MDNR. All ACM material removed will be packaged, marked and disposed of in an approved sanitary landfill that accepts ACM. Contact MDNR and notify them of the Bridge related emergency. Follow guidance for Bridge Maintenance renovations over the regulated threshold quantities. See item #1 above. 4. MoDOT employees will follow MoDOT’s Respiratory Protection Policy when working on bridges. 5. MoDOT employees will follow MoDOT’s Asbestos Protection Policy when working on bridges with ACM. 6. MoDOT will submit one Asbestos Contractor Registration Application (MDNR Form MO 780-1224) annually for MoDOT bridge maintenance work renovations that occurs statewide. The department shall dispose of garbage, refuse and other discarded material in a permitted sanitary landfill. Materials such as whole tires, batteries, appliances, used oil and hazardous wastes are prohibited from being disposed of in a sanitary landfill and shall be recycled as regulations dictate. Construction and Demolition Waste also considered solid waste from older buildings being renovated or demolished to make room for newer, more modern buildings. Properly managing the waste during the demolition will prevent threats to human health and the environment. Waste tires unsuitable for sale or recapping shall be disposed of under state contract CCO form MT15. Contact an Environmental Specialist for current contract information. Burning tires or tire pieces is prohibited. Tires and tire pieces shall be stored in a manner that avoids providing a mosquito-breeding site. Twenty-five or more whole tires stored at any one site must be covered. Maintain an inventory of less than 500 whole tires at any one site, at any one time, unless they are loaded on a truck for disposal. 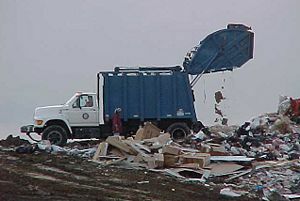 Street sweepings are considered solid waste by the Missouri Department of Natural Resources (MDNR). The sweepings must be disposed of in a permitted sanitary landfill. An exception from disposal in a landfill has been granted by MDNR. To qualify for the exemption, the street sweepings must meet the beneficial use requirements as established by MDNR. To qualify for the beneficial use exception, the sweepings must be composed of grit and dirt from the roadway surface and only minor amounts of trash, litter or automotive parts can be present in the sweepings. The sweepings can contain asphaltic concrete materials as clarified in the April 2010 MDNR approval letter. Street sweepings need to be processed or screened to remove trash, litter and other debris. If the screenings still contain excessive amounts of trash, litter or other debris, additional processing will be required; or the materials will need to be disposed in a landfill. All of the trash, litter and other debris removed by the screening process shall be disposed of in a sanitary landfill. Sampling and testing of the screened grit and dirt material is required by MDNR. At least one sample must be collected for every 500 cubic yards of screened material created. The guidance in the sampling protocol must be followed. This includes proper sample collection, preservation and analysis by MoDOT’s chemical laboratory. Questions regarding the sampling protocol should be directed to the appropriate Environmental Specialist in Design Division. A copy of the sample results must be kept on file at the Maintenance building where the screenings were processed and a copy of the sample results needs to be provided to the Environment section of the Design Division. Reason for Policy: 10 CSR 80 Solid Waste Management Regulations and RSMo 644 Missouri Clean Water Law. In the ANTIFREEZE WASTE MANAGEMENT GUIDE DNR Publication 114, waste antifreeze is not a listed hazardous waste under the federal hazardous waste regulations in 40 Code of Federal Regulations (CFR) 261 Subpart D, but antifreeze may contain metals, particularly lead, and other substances that would cause it to be classified as a characteristic hazardous waste (40 CFR 261 Subpart C). Spent antifreeze from vehicle maintenance activities shall be collected and processed through a MoDOT antifreeze recycler. Antifreeze that is not reused in the vehicle must be sent to a recycler that accepts antifreeze. Antifreeze may never be discharged to storm sewers, septic systems, streams or on the ground. Reason for Policy: 10 CSR 25-5.262, Hazardous Waste Management Program. Reduce antifreeze cost and disposal cost. All non-rechargeable batteries shall be managed as a solid waste. All rechargeable batteries shall be recycled with an approved recycler. Place cracked lead acid batteries in an acid safe container and contact your battery recycler or Environmental Specialist for specific information. All lead acid batteries should be inside secondary containment. Reason for Policy: 40 CFR 266.80 Rechargeable batteries contain specific hazardous components such as nickel, cadmium, mercury, lead and sulfuric acid that cause the batteries to be a hazardous waste unless they are sent to a recycler, DNR publication 2058. Animal carcasses found on MoDOT right of way shall be disposed of properly. Options for disposal are listed below under Accepted Disposal Practices. It is the supervisor's responsibility to choose the option that best suits the needs of their particular area. Disposal practices other than the accepted practices listed below will require State Maintenance Engineer approval. Since the distribution of a 1987 letter of agreement, MoDOT has reported all deer killed on its right of way to the Missouri Department of Conservation (MDC). Each deer found on MoDOT right of way is to be reported to the district office and the information logged on the Deer Death Report Form and Map (Excel). The monthly log sheets are to be forwarded to the Maintenance Operations Functional Unit at General Headquarters by the 15th of the following month. The information will be forwarded to the MDC. Option 1 - Bury the carcass on highway right of way, provided it is not prohibited by local ordinances, and not in a waterway. The carcass should be buried at a minimum depth of 30 inches. Call 800-DIG-RITE (800-344-7483) prior to digging. Option 2 - Dispose of the animal carcass at a state-approved sanitary landfill, with the landfill operator's approval. There will likely be a fee associated with this option. Option 3 - Dispose of the carcass in an animal compost bin, which can be built at a maintenance facility. The procedures for building composting units shall meet the guidelines established by the University of Missouri as outlined in DNR publication 1250. Option 4 - Dispose of the carcass at a site and in a manner pre-approved by the MDC. Written approval from MDC is required. Option 5 - Where available, the carcass may be taken to a city or county animal control facility equipped to dispose of animal carcasses. Option 6 - Missouri law allows an individual who has struck and killed a deer with their vehicle to claim the deer carcass if written authorization to possess the deer is granted by a MDC Agent. Option 7 - Disposal of domestic animal carcasses by the owner is allowed provided the owner can be identified in a timely manner. If there are any identifying marks on the carcass, department personnel shall attempt to notify the owner. Reason for Policy: RSMo 269 Environmental Control 40 CFR 30 Federal Endangered Species Act, DNR Solid Waste Program and Water Pollution Control Program,MoDOT liability. MoDOT may become responsible for abandoned drums and containers, illegal dumped chemicals and accidental releases of hazardous materials on department property. When hazardous material spills and incidents are discovered on department property, MoDOT personnel shall follow the department's Hazardous Materials Response Plan to assure the material is handled properly. Reporting will be made to the Missouri Department of Natural Resources (MDNR) Environmental Emergency Response (EER) (573) 634-2436 in accordance with MoDOT procedures and Missouri RSMo 260.500 through 260.550. Note: All unknown materials and containers will be treated as hazardous waste until proven otherwise. When an unknown material or a known hazardous material is discovered on the department's property, the District Hazardous Material Coordinator (DHMC) will be notified. The DHMC will call the MDNR EER 24 hour hotline number, (573) 634-2436, and report all information available. It will then be the responsibility of the MDNR EER to determine if the material is hazardous. If DNR makes the declaration of a “hazardous substance emergency”, they will (1) respond with their own resources, or (2) contact the contractor to respond to the incident. In either case, either party will conduct the initial containerization and remove the material from the ROW to the nearest available storage facility, while any additional waste stream profile analysis is performed. MoDOT staff will arrange for any required shipment, disposal and reporting once waste stream profiling is complete. The DMHC shall notify the appropriate Environmental personnel of the spill through the spill reporting e-mail group for all spills that require a DNR response. In the event the abandoned container is neither leaking nor bulging, but is located within the clear zone, then the same contact protocol would apply as specified above. The only exception would be if MDNR were unable to respond immediately to the incident (due to lack of personnel availability, etc. ), then MoDOT shall contact the appropriate emergency response contractor as specified in our Hazardous Substance Cleanup & Disposal Services OA contract to ensure a timely response. If a responsible party cannot be identified, then the response, characterization and disposal costs would become the responsibility of MoDOT (for either hazardous or non-hazardous substance responses). In those instances where an owner (responsible party) can be identified, MoDOT will seek cost recovery from the owner. If there has been a release, it will be necessary to coordinate with district Traffic personnel to write a permit to the responsible party or the emergency response contractor to allow cleanup on department property. Note: Discovery of suspect mobile meth labs shall follow a variation of this process, as outlined in “Publication for Dealing with Mobile Meth Labs”, due to the law enforcement aspect associated with this material. Hazardous material spills, and spills of other materials that leave MoDOT property and enter waters of the state from MoDOT operations are the responsibility of the Department and will be reported to the MDNR EER 24 hour hot line number immediately by the first Department employee to discover the spill. That employee will also notify their supervisor and the DHMC. The DMHC shall notify the appropriate Environmental personnel through the spill reporting e-mail group. MoDOT employees shall take immediate action to contain the release and clean up spilled material. Reporting shall be made to the Missouri Department of Natural Resources (MDNR) Environmental Emergency Response (EER) 573-634-2436 in accordance with MoDOT procedures and Missouri RSMo 260.500 through 260.550. If any of the material spilled comes in contact with waters of the state (creeks, springs, rivers, groundwater or ponds) the incident shall also immediately be reported to the National Response Center (NRC) at 800-424-8802. Incidents during the normal working day shall be reported to the district as soon as possible. The District office shall in turn report to the Maintenance division as soon as possible. Should an incident occur after normal working hours, information should be telephoned to available maintenance personnel. The DHMC shall also notify Environmental staff through the spill reporting e-mail group of any spills contained on MoDOT property that do not involve a release to waters of the state, and meet the spill thresholds outlined in the "Top Ten Spill Prevention Items" (i.e., spills at maintenance facilities or during maintenance operations). All rest area lagoons shall have a current National Pollution Discharge Elimination System (NPDES) permit. These permits require the department to submit discharge samples results on a regular basis to the Missouri Department of Natural Resources. The department will comply with all requirements of the (NPDES) permits. Application for renewal shall be submitted to MDNR every five years at least 180 days prior to the expiration date of the permit. All NPDES permits must be kept current.The NPDES permit describes the limits and requirements for each specific site. These requirements include the discharge limits, frequency of sampling, location of sampling and where sample results are to be submitted. All reporting requirements and sample collection will be in compliance with the NPDES permit. A copy of the permit shall be readily available to the person who conducts sampling and report submittal. All rest areas that are using on-site wells as the source of drinking water shall have a valid operating permit issued by the Missouri Department of Natural Resources (MDNR) Public Drinking Water Program (PDWP). Operation and maintenance of these wells shall be in accordance with the MDNR-PDWP rules and regulations pertaining to drinking water supplies. Rest areas that are served by a municipal or public water supply shall adhere to specific rules and regulations established by the water supplier concerning operation and maintenance of the water distribution system. For additional information see EPG 127.25.4.3 Well Closures and EPG 127.25.3.2.1 Well Drilling. The district office shall request the Department of Natural Resources (DNR), Research and Technical Information Division, Rolla, Mo., to advise the district office concerning the expected depth of the proposed well and the estimated casing depth. The district office will use the "Standard Bid Form - Well Drilling" to receive bids for the work from only licensed well drillers. The district shall appoint an employee who is familiar with well drilling to make regular inspections of the work in progress. For additional information see EPG 127.25.3.2 Rest Area Drinking Water and EPG 127.25.4.3 Well Closures. MoDOT activities disturbing one acre or more of total land area require storm water permit authorization from the Missouri Department of Natural Resources (MDNR). This includes many construction and maintenance grading operations. The "MoDOT Operating Permit for Land Disturbance" from the MDNR authorizes these MoDOT grading activities so long as a site-specific storm water pollution prevention plan (SWPPP) has been developed for the activity prior to commencing land disturbance. Some minimal impact activities, such as narrow linear, strip or ribbon construction or maintenance activities such as cleaning or routine maintenance of roadside ditches are exempt from the storm water permit requirements. Contact the MoDOT Stormwater Compliance Coordinator if you have questions. Note: The MDNR defines storm water as storm water runoff, snow melt runoff, surface runoff and drainage. For additional infoprmation see Activities Requiring Permits. The specific regulatory authority for the COE is based on the following laws: Clean Water Act-Section 404; Water Quality Certification-Section 401. The proper abandonment of water wells is imperative to the protection of ground water. All wells not in use or planned to be used shall be properly closed to comply with the Water Drillers Act. A permitted water well, pump installer, monitoring well or heat pump installer shall oversee the closures. Contact an environmental specialist for guidance in well closures. See EPG 127.25.3.2 Rest Area Drinking Water and EPG 127.25.3.2.1 Well Drilling. Underground fuel storage tanks and their piping are required to have operational, approved leak, corrosion and overfill protection and, when necessary, vapor controls. A tank registration form shall be submitted to the Missouri Department of Natural Resources within 30 days of bringing a tank into use and when a change is made to the tank or ancillary equipment. All above ground tanks shall be labeled as to their contents. Any facility that has any kind of oil storage capacity (55 gallons or larger containers) that totals 1320 gallons aggregate, is required to have a SPCC plan. All above ground tanks containing oil-based product are required to have secondary containment with sufficient capacity to hold the largest container plus the maximum expected rainfall. The plan must be made available to an EPA inspector if requested during an on-site inspection. Tanks that exceed the minimum reportable quantity of hazardous material require an NFPA 704 Hazard Communication sign. For additional information see EPG 127.25.5.1.1 Fuel Pump Calibration. Fuel pumps shall be calibrated annually except for those that have a history of reporting errors, or when normal tracking of petroleum usage indicates that there is a problem. Those pumps that are showing unacceptable variances should be calibrated as needed and corrections made until the problem is solved or the pump is replaced. For additional information see EPG 127.25.5.1 Fuel Storage Tanks. Reason for Policy: MoDOT inventory requirement to eliminate petroleum theft. Instructions on container labels shall be followed for storage, use and disposal of containers and their contents. Empty herbicide containers shall be triple rinsed with water and the rinsate reused in mixing operations. The container shall be returned to the supplier or disposed of in a permitted sanitary landfill or sent to a recycler. To dispose of containers containing some herbicide material or an out of specification herbicide, contact an Environmental Specialist for assistance. All empty (less than an inch of product remaining) containers, including 55 gallon drums, shall have all openings closed with containers stored on their sides to prevent rainwater from mixing with product residues. All MoDOT Maintenance activities shall be conducted in a manner that does not impact any federally or state listed threatened or endangered species or their critical habitat. If an activity will impact a listed species, MoDOT must conduct formal consultation with the U.S. Fish and Wildlife Service and obtain a Biological Opinion prior to conducting the activity. Prior to starting any new activities (mowing, spraying, etc.) or changing methods for conducting established activities maintenance personnel should contact Chris Shulse at (573) 526-6678 or Bree McMurray at (573) 526-0606 to determine if the activity will impact any rare species or critical habitat. A copy of the Tier II Reporting form shall be clearly posted on a bulletin board in each maintenance building. Tier II refers to state and federal Emergency Planning Community Right-to-Know Act (EPCRA). The department shall comply with all Federal Resource Conservation and Recovery Act (RCRA) and Missouri Department of Natural Resources (MDNR) regulations regarding waste materials. This includes the generation, transportation, storage, and disposal of hazardous waste. The Department of Natural Resources' Hazardous Waste Program's Compliance and Enforcement Section works to ensure compliance with hazardous waste laws. If you have reason to think your site or location is producing a hazardous waste you should contact the district Hazardous Material Spill Coordinator or an Environmental Specialist in Design division. Reason for Policy: 10 CSR 25-1.010 and 10 CSR 25-14.010, Missouri Hazardous Waste Management Regulations, RSMo. 260, 40 CFR 260 - 265. Generators must use products for their intended purpose. A product can become a waste if a facility does not properly store the material or the product is beyond its shelf life. If a generator is no longer using the product, it must be properly disposed and not abandoned or stored. A facility storing a material that is a hazardous waste must comply with Missouri’s hazardous waste regulations. Missouri Department of Natural Resources has produced the Waste or Product Determination Guidance publication 1349 to provide criteria to consider when a product becomes a waste. 3. Performance of lead abatement activities. 3. The contractor shall also provide notification to DHSS through the submittal of a lead abatement project notification form which is required to be submitted 10 days prior to the onset of lead abatement projects. Lead based paint removed from any surface is considered a hazardous waste. Lead based paint removed from steel structures or buildings shall be containerized, labeled and disposed of at an approved hazardous waste facility. In some instances, the lead paint and blast material may be recycled and exempted as a hazardous waste. Contact an Environmental Specialist for assistance or additional information. Reason for Policy: RSMo. 260-265 and 40 CFR 268, 10 CSR 25-4.010, Hazardous Waste Management. RSMo 701.300-701.332 and 19 CSR 30-70.600(19), Lead Abatement and Assessment Licensing, Training Accreditation. All efforts are made to identify products that are not only safe for the environment but our employees also. The approved products list outlines those products which meet the objectives for both environmental compliance and worker safety. Some product review information is also available. Reason for Policy: Clean Water Act, Solid Waste Law, Hazardous Waste Law. MoDOT desires to produce as few hazardous wastes as possible. Chlorinated solvents pose a health risk to employees. Contact your Environmental Specialist for more information. The department shall store used oil, prior to shipment off-site, in containers that are in good condition, void of leaks and clearly labeled as used oil. All oil storage tanks are required to be included in the SPCC plan and have secondary containment with sufficient capacity to hold the largest container plus the maximum expected rainfall. NOTE: Used petroleum fluids such as gear lube, transmission oil and hydraulic oil are defined as used oils. Mixing solvents or antifreeze with used oil is strictly prohibited. Records of contracts, shipper name and identification number, dates of shipment, quantity and type of oil and the processor's name and permit number shall be kept on file. Additional information on regulation and disposal of used oil is available through DNR. Reason for Policy: 10 CSR 25-11, Hazardous Waste Program. The department must file a quarterly summary report for all MoDOT hazardous waste shipments from the large quantity generator sites with the Missouri Department of Natural Resources (MDNR). Annual reports are required for small quantity and one-time shipment sites. Following receipt of a copy of the hazardous waste manifest from the hazardous waste disposal facility, the Environmental Specialist shall forward a copy of the manifest to both the district hazardous materials spill coordinator and Central Office Design. If the manifest is not received from the hazardous waste facility within 45 days, an exception report must be filed with MDNR. Reason for Policy: 10 CSR 25-5.262 Missouri Hazardous Waste Management Regulations. Contact individual county planning and zoning offices for areas requiring compliance. Trade wastes are defined as solid, liquid, or gaseous material resulting from construction or the prosecution of any business, trade or industry or any demolition operations including, but not limited to cardboard, plastics, cartons, grease, oil, chemicals or cinders. Trade wastes include scrap lumber and wooden shipping pallets. Refuse is defined as garbage, rubbish, trade waste, leaves, salvageable material, agricultural wastes or other wastes. Reason for Policy: Comply with State Regulations Air Pollution Control Law and Regulations 10 CSR 10-6, Air Pollution Control Program RSMo 643. Lead mining chat encapsulated in asphalt or concrete, may be used for highway construction. Special requirements apply to chat from the Tri-State Mining District (Jasper, Newton, Lawrence and Barry Counties in southwest Missouri) as referenced in . Refer to Missouri Standard Specifications for Highway Construction 1001.12. For additional information see EPG 127.25.8.2.1 Abrasives. Reason for Policy: MDH Health Study established to protect the health of workers and persons living along roadways. Air Pollution Control Law and Regulations 10 CSR 10-6, Air Pollution Control Program, RSMo 643, 40 CFR 260-265, 40 CFR 268, RSMo 260, 10 CSR 25-4.10. The maximum aggregate size for abrasives shall not exceed 3/8 inch. Lead mining chat (within established limits) may be used for general maintenance purposes. See 127.25.8.2 Lead Mining Chat, for requirements for chat from the Tri-State Mining District. See Missouri Standard Specifications for Highway Construction Sec 1001.12 for established lead limits in mining by-product aggregates. For additional information see EPG 127.25.8.2 Lead Mining Chat. Reason for Policy: Experience has shown that an aggregate size larger than 3/8 in. is ineffective and contributes to broken windshields. Mine tailings may contain environmentally unsafe materials. Where a sewage system at a present maintenance site is being modified or when a sewage system is being designed for a new facility, the department shall consider the feasibility of connecting onto a publicly owned waste water treatment plant (POTW). If it is not economically feasible to connect to a POTW, an on-site sewage treatment system shall be considered. The required construction permit shall be obtained from the Missouri Department of Health or the Missouri Department of Natural Resources, Water Pollution Control Program, prior to construction. For additional information see EPG 127.25.8.3.1 Industrial and Domestic Waste Waters on Right of Way. Reason for Policy: RSMo 701.025 - 701.059 State Standards, RSMo 644 Water Pollution Control Program, Federal Clean Water Act 33 U.S.C. 1251-1387. Sewage and waste shall be disposed of by discharging into a sewer system regulated pursuant to chapter 644, RSMo, or shall be disposed of by discharging into an on-site sewage disposal system operated as defined by rules promulgated pursuant to sections 701.025 to 701.059, RSMo. Any person installing on-site sewage disposal systems shall be registered to do so by the Missouri Department of Health and Senior Services. Private homeowners are regulated by the Missouri Department of Health and Senior Services. The Missouri Department of Health and Senior Services is to be contacted when wastewater discharge from private homeowners is found on right of way. If a property owner requires assistance in containing effluent, they should be directed to the Department of Health for assistance. Commercial businesses and industries are regulated by MDNR. When wastewater discharge from a regulated entity is discovered on MoDOT right of way, the Environmental Specialist will contact MDNR to determine if the commercial business or industry has a valid operating permit issued by MDNR to discharge effluent. The Environmental Specialist will request MDNR to take whatever legal action necessary concerning any business or industry that does not have a valid permit from MDNR to discharge effluent to the highway right of way. For additional information see EPG 127.25.3.1 Rest Area Lagoon, EPG 127.25.8.3 Sewage Disposal System and EPG 127.25.8.3.2 System Attachments by Others. Piped connections to the drainage system are prohibited unless approved by the district engineer. In situations where connections are permitted, plans and specifications are required to meet MoDOT specifications. If approved, the work shall be done under an approved permit and/or a Missouri Highway and Transportation Commission Agreement. Attachments to bridges and large box culverts that qualify as bridges should be referred to the Bridge Division for review. Connections to MoDOT's drainage system should be reviewed for compliance under MoDOT's MS4 stormwater permit. For additional information see EPG 127.25.8.3.1 Industrial and Domestic Waste Waters on Right of Way and EPG 127.29.5 MCM 3. Reason for Policy: Protect MoDOT from possible litigation. Protect the current drainage system. Department vehicles transporting regulated quantities of hazardous waste shall be placarded. MoDOT is exempt from placarding asphalt distributors and product shipments. The department shall operate in a manner that minimizes and/or prevents fugitive dust from going beyond MoDOT property lines or off right of way. Dust from operations such as concrete sawing, crack and joint repair, street sweeping and roadway rotomilling shall be contained on department property. Reason for Policy: 10 CSR 10-6.170, Air Pollution Control Program. Provide driving conditions free from dust obstructions. A permit may be required for vehicle painting using power spray operations at maintenance buildings. When required, such permits shall be acquired prior to initiation of painting operations. Painting with a brush or touch up painting with an aerosol can does not require a permit. All properties to be disposed of or purchased shall have an environmental review conducted prior to selling or purchasing. Environmental reviews are conducted for the benefit of the department to identify existing or potential environmental liability that may be present. Environmental reviews shall be conducted by the Environmental and Historic Preservation section of Design. Reason for Policy: Reduce MoDOT liability. Measures shall be implemented that will eliminate damage to adjacent property from salt runoff generated from maintenance facilities. Salt and salt mix shall be stored under waterproof cover. For additional information see EPG 127.25.8.8.1 Storage. Reason for Policy: RSMo 644 Water Pollution, Federal Clean Water Act 33 U.S.C. §§ 1251-1387. There have been a number of incidents in which salt, salt brine, liquid calcium chloride runoff, or spillage from the storage of salt has caused environmental damage. Storm water runoff from salt piles, brine and calcium storage tanks and mixing areas has proven to be detrimental to aquatic life and vegetation. Chemicals and stockpiles of treated abrasives are to be stored in a manner to prevent loss of material and prevent damage to State or private property. All bulk salt shall be stored inside covered storage structures. Asphalt pads are to be constructed under and in front of all storage facilities. Mixed materials shall be covered when not in use and between storm events. For additional information see EPG 127.25.8.8 Salt Runoff. Reason for Policy: Prevent loss of material and drainage to private property. Most salt runoff damage comes from mixed piles. This page was last modified on 10 January 2019, at 14:19.